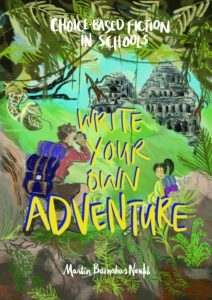 Write Your Own Adventure is a literacy programme that uses choice-based fiction to engage reluctant writers, challenge gifted students and bring about an enthusiastic culture of writing for an audience. It draws on years of classroom practice and the powerfully engaging qualities of a story style that puts the reader – and the writer – fully in control. The teacher’s resource book, Write Your Own Adventure: Choice-Based Fiction in School is now available on Amazon. Inside the book are plans and resources, together with thorough discussion, to enable Literacy co-ordinators, classroom teachers and other practitioners to use choice-based fiction writing projects in their own schools. Photocopiable resources include thirteen choice-maps for writing individual, group or class adventures and the entire Maze of Madness gamebook, ready to print and write to create your first class adventure. I’m massively pleased to say that the gorgeous cover has been designed for me by my talented wife, Cheryl Adamos Noutch, whose further work you can see at encourageart.co.uk. I also offer Write Your Own Adventure in a variety of workshops and projects that I can teach in your school or club. If you would like to see Write Your Own Adventure in action in your school, I can be booked through the reliable Authors Abroad. 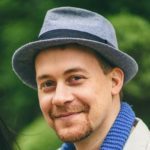 Is it possible to create an interactive, thematic choice-based adventure book in a single afternoon? Of course it is! Through focused warm-up activities, specialised writing tasks and an inspirational opportunity, your class can write an adventure that they will read and re-read over and over again, celebrating each other’s achievement and inspiring them to explore choice-based fiction. Would you like to see each child in your class equipped and supported to write their own individual choice-based adventure story? Over six weekly sessions, they can be given the skills and inspired to create an adventure to delight and challenge their classmates and their family. This project is a powerful way to create a writing culture in your classroom – or to give an chance for your students to really see the purpose of their writing. Are you looking for something new to inspire your boys who still seem uninterested in writing? Do you have writers with great ideas but who struggle to express them? Do you have talented learners who deserve to be stretched and taken beyond the requirements of the curriculum? A tailor-made programme to bring about progression in literacy can provide your learners with specialist teaching that builds genuine engagement and independence. Write-Your-Own-Adventure can also be successful as an after-school club, providing an opportunity for children from a range of Years and classes to participate in the fun! Collaborative learning and celebration of shared successes are a key part of this group, but it also gives a structured space in which students can write with an teacher’s full attention. 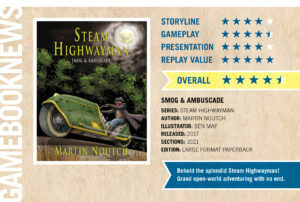 Write-Your-Own-Adventure sessions are delivered by Martin Noutch – an experienced teacher, ex-Literacy Lead and author of Steam Highwayman. Find out more about Martin.